Put a tasty twist on a classic Thanksgiving dish when you make our Turkey with Ancho Adobo recipe. 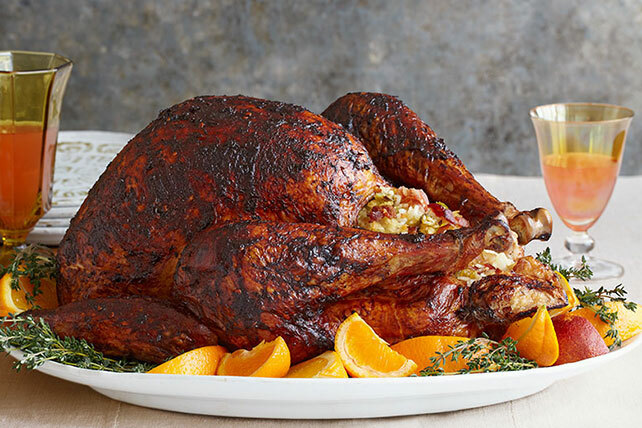 With a delicious mix of savory, tangy and spicy flavors, this Turkey with Ancho Adobo recipe is the perfect way to shake things up. Cook bacon in large skillet until crisp. Use slotted spoon to remove bacon from skillet; drain on paper towels. Discard drippings from skillet. Add garlic, celery, raisins, thyme and 1 cup orange juice to skillet; stir. Cook 5 min. ; stir in rice and bacon. Remove from heat; cool 15 min. Remove neck and giblets from turkey cavities; discard. Free legs from tucked position, but do not cut band of skin. Place turkey, breast side up, on rack in roasting pan. Stuff turkey with rice mixture; brush with oil. Cover breast loosely with foil to prevent overbrowning. Bake turkey 3 hours 45 min. Meanwhile, blend remaining orange juice, barbecue sauce, peppers and oregano in blender. Brush turkey with 1/3 cup barbecue sauce mixture; bake, uncovered, 30 min. or until done (165ºF). Let turkey stand 15 min. before carving. Meanwhile, remove excess fat from turkey drippings and pour into saucepan; add remaining barbecue sauce mixture. Bring to boil, stirring frequently. Serve with your favorite hot steamed fresh vegetable. Place the cooked turkey on a large cutting board. Use a sharp heavy knife to cut off both legs and thighs. (Twisting the thigh joint helps to remove the leg from the turkey.) Cut the dark meat from the bones and place on platter. Carve the breast meat by making a slice along one side of the breast bone and continue to slice downward, separating the meat from the cavity. Then cut along the bottom of the breast. Cut slices from the breast meat. Repeat on the other side of the breast bone. Arrange sliced meat on platter. To safely thaw a frozen turkey, place turkey on tray and refrigerate until thawed, allowing 5 hours for each pound of turkey. Or, place turkey in sink and keep covered with cold water until turkey is thawed, allowing 1 hour for each pound of turkey and changing the water occasionally.